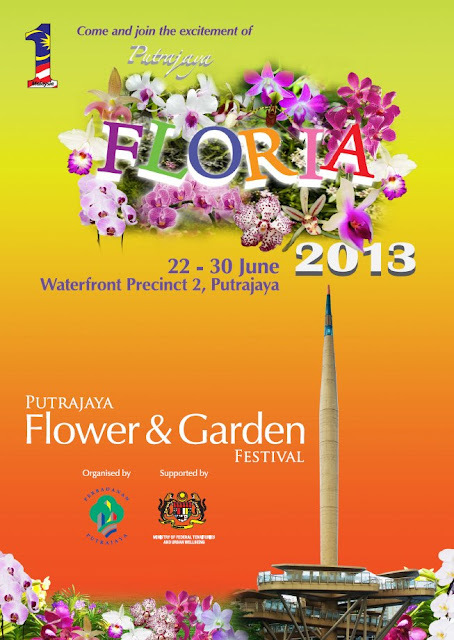 If flowers are your passion, then you cannot afford to miss out Putrajaya’s annual celebration of flowers- the Putrajaya Flower and Garden Festival 2013. The festival which showcases the best of Malaysia’s landscape and horticulture industry is the biggest annual event in this planned city. Records indicate that last year’s edition of the festival, which featured the garden designs of 16 international participants along with 100,000 varieties of bougainvillea plants, attracted more than a million visitors.This year garden designers from far away as the UK and South Africa have been invited to show at the event which is due to run over nine days from Saturday 22nd June to Sunday 30th June. Admission to this festival of flowers and gardens is free for the public. The theme for FloriaPutrajaya, this year is Orchid-Tropical treasure. This exotic bloom, which currently exists in various diverse forms and structures the world over is much admired and evenmarveled at. In fact, more than 100 genus and 800 species of orchids are found in Malaysia alone. FloriaPutrajaya 2013 will offer displays of more than 100 varieties of orchids including common orchids found in gardens and meadows alongside wild, fragrant and rarer species of the this exotic bloom. The Grand Flower Bed is showpiece attraction of the festival. This spectacular display in 2013will be dominated by orchids of every hue and structure. Beside orchids, you can also expect to see other colorful and fragrant blooms like roses, hibiscus, flowering herbs, bonsais and many more. A profusion of orchids will in fact be visible in various sections of the festival like the Floral Alley, the Floral Avenue, and the Floral Meadow amongst others. The Showcase Gardens section promises to be another prominent attraction at the show. This section will display the talents and green thumbs of local and international landscape designers and architects, along with garden exhibits created by corporates, NGOs, universities and schools. The area will also feature themed gardens like ‘My Backyard Garden’, ‘Grower Display Garden’ and ‘Courtyard Garden’. The Royal Garden, this year bears the theme ‘Tropical Splendor of Orchid’. Inspired by geometrical and symmetrical design elements of English and French Royal gardens and incorporating traditional design elements, the Royal garden will also have on show a rare, native, epiphytic orchid, BungaPuteri which is believed to be the world’s largest orchid. The Floral Pavilion will feature indoor and outdoor sections and various individual gardens like a tropical bamboo garden, a floral carpet and a floral tunnel along with other attractions. Returning to the FloriaPutrajaya 2013, will be LamanSeni, a floral art square which will offer arts and crafts inspired by nature for sale. FloriaPutrajaya will also feature a long 300 m landscaped floral wall, which the organizers hope will make it to the Malaysia Book of Records. The popular Therapy garden will once again make an appearance in FloriaPutrajaya 2013, and offer spa services like foot, shoulder and hand massages along with reflexology treatments. The Tea Party Garden will feature an outdoor café set amongst various landscaped, verdant gardens. This garden café will have on offer a wide array of baked goods, beverages and other local treats for visitors to Floria Putrajaya. The Garden Bazaar, is the retail aspect of FloriaPutrajaya 2013, where products like plants, gardening accessories and equipment, biotech products, landscaping services, outdoor furniture and more, will be offered for sale. Aside from its show element, the Putrajaya garden festival will also feature a ‘best in show’ competition for orchids. Other competitive events will include flower arranging contests and nature photography and painting competitions. FloriaPutrajaya aims to enchant and delight all ages, and hence offers a variety of attractions for young visitors like a petting zoo, a kiddie Playland and much live entertainment.